Summary: Venezuela has withdrawn from the Andean Community (CAN) customs union, in favor of joining Mercosur, another union in South America. The switch has been represented as a protest against free trade agreements made with the United States on the part of CAN members Peru and Colombia. Admission into Mercosur is still pending, though Venezuela remains a member of the Union of South American Nations (UNASUR). Although nation-states are usually considered the basic units of the modern political globe, it has become common in recent decades for countries to work together towards integration at a higher level. The most well known case, and probably the furthest advanced, is the European Union. However, there are a number of other intergovernmental organizations working for integration in other parts of the world. 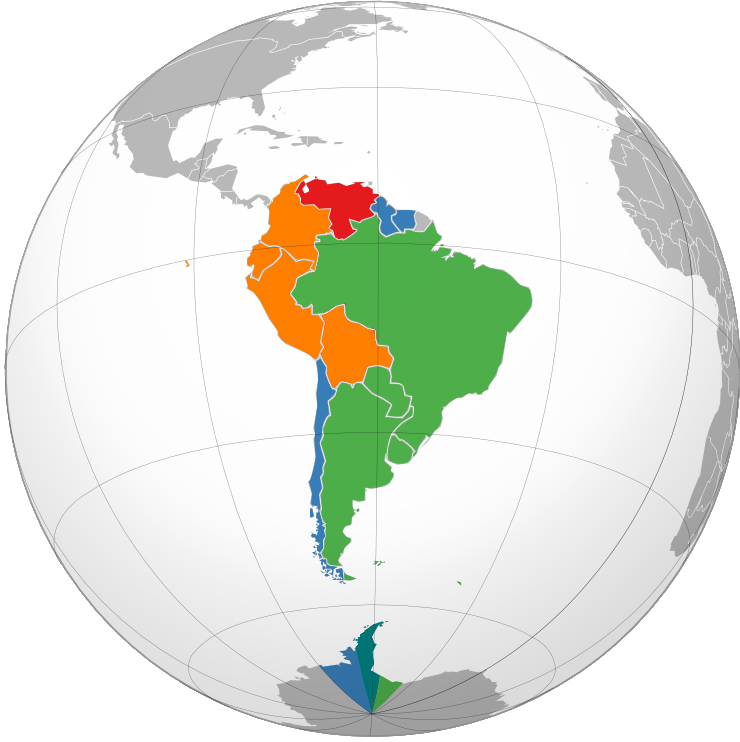 In South America, supranational integration has progressed largely through two major trade blocs: the Southern Common Market (known by its Spanish or Portuguese abbreviations, "Mercosur" or "Mercosul") and the Andean Community (known by the Spanish abbreviation, CAN). The Andean Community represents a group of countries in the northwestern part South America, while Mercosur is centered around the southeastern region of the continent. The country of Venezuela, located in the north of the continent at the meeting place of the two blocs, has long been a member of the Andean Community. However, in 2006 the Venezuelan government announced the intention to switch its membership to Mercosur. Citing free trade agreements made between the United States and CAN members Peru and Colombia, Venezuelan president Hugo Chávez announced that he believed CAN was no longer relevant. After five years, Venezuela fully withdrew this month from the Andean Community. Admission to Mercosur is still pending, though it seems likely in the near future. CAN and Mercosur have both implemented trade agreements forming customs unions between their members - that is, they have mostly eliminated tariffs between member countries, and have also unified their external customs regulations to be consistent among the whole bloc. They have also proceeded with other cooperative programs, such as coordinating economic policies and setting up courts with international jurisdiction. Over the last decade, they have been working towards integrating with each other to form the Union of South American Nations (USAN or UNASUR/UNASUL), an organization modeled after the European Union. In fact, UNASUR includes all of South America's sovereign states, independently of their membership in CAN or Mercosur, which means that Venezuela will remain a member of UNASUR during its transition period. Venezuela's bid to join Mercosur had originally been seen as a gesture towards integration between Mercosur and CAN, though that is clearly not the case now that the country has withdrawn from CAN.